Homerun PAS Oil Pastels are manufactured by Colour Products (Pvt) Ltd. in Sri Lanka. I received three different sets of oil pastels to review. Of them, one lists itself as artist grade and another mentions excellent lightfastness. Until I've got a sunny window to do home lightfastness testing, all I can do is mention the manufacturer's claims. This is something I've faced with other artist grade brands though. I have to think that truth in advertising laws prohibit advertising a product as lightfast if it clearly fades in a short time under strong sunlight. One interesting thing about these products is that Colour Products Ltd. will produce them for other companies. You can pay wholesale and have the company create sets of oil pastels with your brand and logo on the boxes and the wrappers. To me this may answer the question of what some of the off brand or house brand oil pastels are, although I don't know if Colour Products Ltd. produces all of the private label oil pastels. I'm pretty sure they don't because all three sets had much better quality than I've found in various discount and house name brands. The texture on the small round pastels, square pastels and the large round pastels was uniform, soft and didn't crumble. These are at least in a category with Gallery Artist Soft oil pastels and fall between Neopastels and Cray-Pas Specialist in texture. Softer than Cray Pas, firmer than Neopastels. If you want to order good oil pastels for your school or company, this service could be great for you. I'll go into the qualities of the three different sets I've tested now. The prices are listed as Rs, so that's probably Rupees. I don't know the conversion rate into American dollars so I can't say whether these are expensive or not in the West. 12 color set of Picasso oil pastels is Rs 105.00.36 color set of Fantasy oil pastels is Rs 265.00.47 color set of Homerun PAS oil pastels is Rs. 280.00. To see these printed manufacturer's suggested retail prices in relation to American dollars, I used a currency conversion website. $1.00 US translates into LKR 110.069. The equivalent in India's rupees is INR 49.7951. 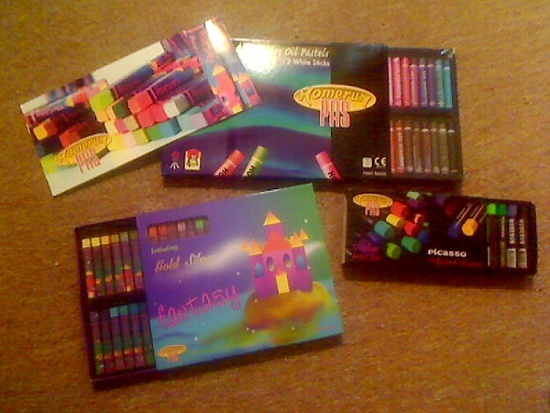 So these are probably inexpensive oil pastels compared to brands like Holbein or Sennelier. If those prices were in dollars they'd be way up in the highest artist grade price range, instead they're a good bargain. The company is fifty years old and is committed to world wide distribution, so hopefully you'll be able to get these where you live, especially if you're closer to Sri Lanka and may have trouble with some of the other artist grade brands. Homerun PAS "Picasso" oil pastels are jumbo sticks. My review package included a set of twelve with a good color range for such a small set. Pink and Violet are included along with orange and green. There's only one red but it's a slightly cool (purplish) mid red good for mixing. Texture on these large pastels is firm and relatively non-crumbly. They remind me quite a lot of Pentel or Niji in their softness, smooth laydown and few crumbs. I've been looking for something that has the Pentel texture and good lightfastness for a long time now - there's a reason Pentel and Niji are student grade. Paste a sample into a sunny window and you'll find out how fast they fade - but Pentel are the pastels of choice for several good realist oil pastel painters I know with their beautiful texture. Homerun PAS may be the answer. First I sketched with them on Aquabee Recycled Rough Sketch Paper with broken color and with areas of smooth color. I tested color over complementary color in the yin-yang sketch at the bottom. With firm pressure, the small complementary spots in the centers of the teardrop shapes came out bright and true despite heavy layering under them. I did not reserve or even scrape those spots. These oil pastels are versatile, blend easily, firm but easily blended. Softness in relation to artist grade brands is closer to Cray Pas than the softer brands. Opacity and coverage are excellent. They handle well. 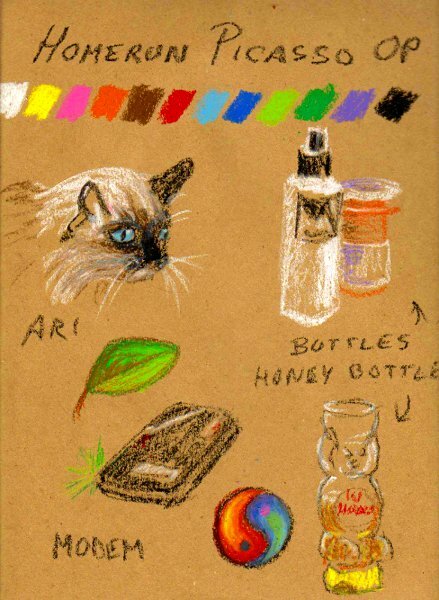 I was able to stack three or four blended layers to get exact hues in some areas of my cat portrait, the yin-yang symbol, the honey jar and the leaf. Of the three sets, Homerun PAS "Picasso" extra large round sticks are a good choice for sketching. Their strong color, fewer crumbs and smooth blending would make them useful to adult artists and children. All three of these sets are listed as non toxic. While that often indicates a student grade pastel, there are some notable exceptions. The good thing is that using a non toxic artist grade pastel means not having to shut your children out of the studio, it's possible to let your kids try these safely. Packaging is a sturdy cardboard box with a styrene slotted insert and a cardboard sleeve the box slides into like a drawer. One stick broke in half during transportation but both pieces are usable. You may want to peel the labels off to use the sticks on their sides or break them in half deliberately to produce bold strokes with the side of a stick. Homerun PAS Fantasy Oil Pastels came in a set of 36 colors that includes metallic silver and gold. Small square wrapped sticks have a firm, creamy texture comparable to Cray-Pas and perhaps a little softer, very suitable for sketching or using on hot days.As is common in many mediums, the metallic silver is a bright rich sparkling color while the gold looks darker, more like bronze. These metallic colors can be used to accent drawings or paintings. If you're using them to depict metallic objects, I strongly suggest using them as a midtone and shading up and down with other colors, white or light yellow, black or dark brown. A sturdy clear tray covers these Fantasy pastels when not in use. Turn it upside down and you can use the tray to hold the colors you're using on the painting, keep them handy when you're using a limited palette. The square sticks are great for details. With eight corners, more if you break the stick in the middle, you can always find an unused corner to put in a small detail or thin line. Wearing the tip down at an angle gives a great chisel tip shape. The firm texture feels just a little softer than the Picasso Jumbo sticks, though they're pretty close. All in all the texture reminds me of Cray Pas and Pentel. These would be excellent for realism. If you want to work with many layers, blend colors with a Colour Shaper to blend them together, these are great pastels. I tested a Firm Colour Shaper on the girl's face. These Homerun PAS pastels blend together beautifully. I had no trouble mixing unique colors on her face or putting highlights over areas already covered in darker colors. I tested the Metallic Silver stick as a mid tone for a shiny metal ball and that worked well too. After using black to put in the core shadow on the ball, I went over it again with metallic silver to smooth it out. I filled the highlight with white but went over some of it with metallic silver too. It gives the impression of a burnished silver ball. If you want a bright, shiny chrome ball, think of doing distorted reflections and using the colors of what's around the ball. Any shiny metal is a curved or flat mirror. 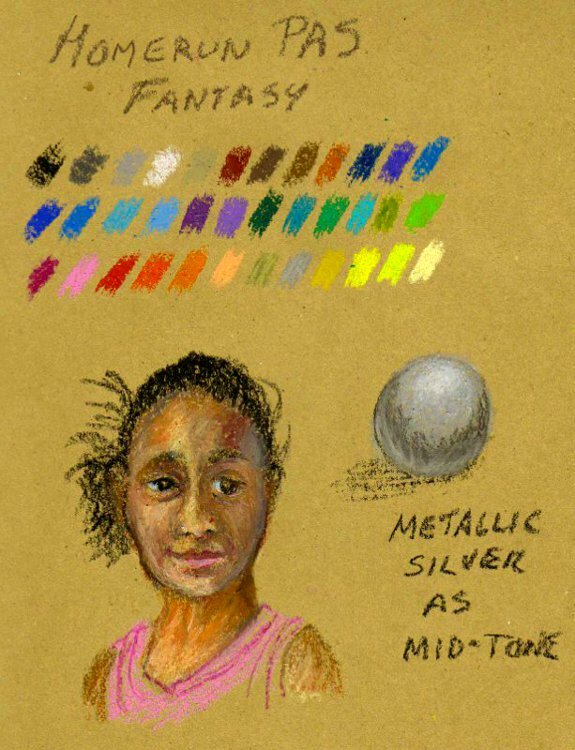 Metallic colors work better for matte metal surfaces where they shine and give a good sparkle to your drawing. Homerun PAS Fantasy pastels came in a sturdy cardboard tray with a cardboard sleeve like the Picasso ones did. They also have a thick clear plastic tray that slides down over them. A stick or two broke in transit but since they were shipped to me from Sri Lanka, I'm not that surprised. The pieces are usable sized and again, I may want to peel and break these pastels to get wider side strokes with them. Homerun PAS Oil Pastels without any other label are firm, creamy, easily blended small round sticks that remind me in shape and handling of Niji or Pentel. They meet the descriptions on the back of the box and with excellent lightfastness, this set fills a need that I've had for a long time. Something like Pentels but safe to use for art I plan to sell. Great coverage, yes, also super blendability. These oil pastels are responsive, smooth and easily blended with another stick, your finger or a Colour Shaper. They're not so stiff that I needed to use an Extra Firm Clay Shaper, a medium stiffness Firm Colour Shaper was enough to move color around, groove it and blend it smoothly. These may be very handy for realism. The small sticks are easy to handle and last a good long time since they're not as soft as Portfolio, Sennelier or Holbein. Even Neopastels are softer and wear down faster. Firm pressure will give strong smooth color, lighter pressure gives easy sketching with broken color. The set has 47 colors because this is the company's 50 year anniversary. It includes two white sticks, a serious convenience for mixing colors. Colour Products (Pvt) Ltd. also made a point of mentioning that no animal fats are used in the production of their pastels. So if you're a vegan or just looking to live more green, these pastels may be a healthy choice for you, your family and the environment. The texture of all three Homerun PAS oil pastels felt similar. None of them had excessive crumbling, they all blended easily and had good strong color. I'd definitely recommend these if you live in a part of the world where they're available on retail. Your sketchbook will thank you for it. You can find out more about Homerun PAS Oil Pastels by clicking the link. If you've tried Homerun PAL oil pastels, especially if you've tested their lightfastness, please contact me through this site. If you know where these are available in stores, please let me know. The website did not list open stock replacements as available, but this isn't to say they may not be available in Sri Lanka. 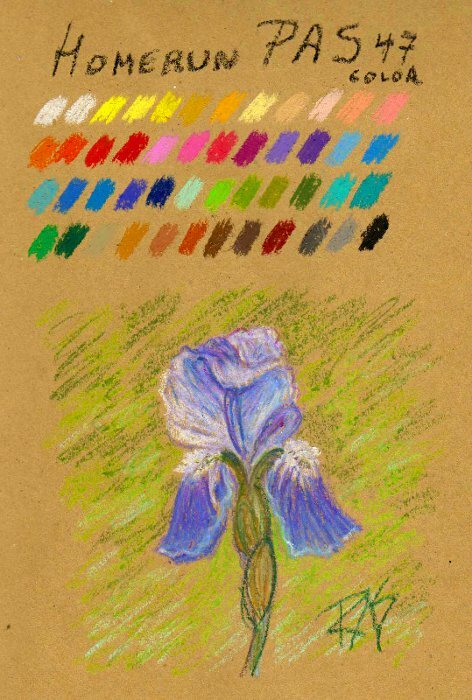 My first version of this review I listed them as student grade primarily because open stock replacement sticks weren't available, however the quality of the pastels has convinced me that may not be as major a consideration.